For a writer, a plate with a love story written on it is irresistible, and judging by the number of Willow Pattern plates still in use, plenty of other people feel the same. I’ve used crockery in the famous blue and white pattern since I began buying my own dishes, ever comforted by the sight of the weeping willow tree, the swiftly flowing river with its arched bridge, and by the souls of the lovers, Chang and Koong-se, immortalised as a pair of doves. For more than a century, most of the major British potteries produced the Willow Pattern. Details have differed, but the story has remained. The very early part of the 20th century was a golden era for the craftsmen who designed and produced tableware in the six towns that make up Stoke-on-Trent, collectively known as The Potteries. Willow’s blue and white naturally led me to other patterns. From secondhand shops, and especially from Jurby Junk on the Isle of Man, I collected a mismatched dinner service, each piece costing no more than a couple of pounds. Some of the stamps on their backs are almost as beautiful as their under-glaze patterns, and I have spent happy hours tracking their histories. 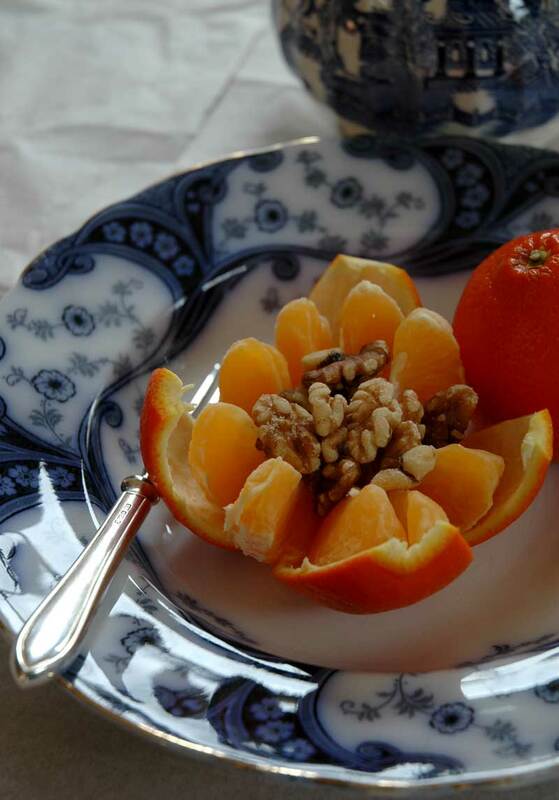 So today’s breakfast is an easy-to-peel tangelo with a small handful of walnuts; it is served on a plate which was probably made around 1912, fired in one of the old bottle, coal-fired kilns that were later replaced by gas. The factory at Middleport, when built, was regarded as a model of Staffordshire potteries. Unbelievably, the makers of this plate, Burgess and Leigh, appear to still be in business. 25 Jul	This entry was published on July 25, 2012 at 12:29 pm. It’s filed under Uncategorized and tagged beautiful breakfasts, blue and white china, burgess and leigh, carol lefevre, creative writing, food writing, isle of man, jurby junk, staffordshire pottery, stoke-on-trent, tangelo, the potteries, walnuts, willow pattern, winter. Bookmark the permalink. Follow any comments here with the RSS feed for this post.